Standard warranty on the products identified herein shall be 5 years from the date the product was received. This warranty is non transferable and does not cover defects arising from accident, unauthorized service, alteration, tampering, misuse, mis-application, neglect, acts of nature or damage. No oral or written information or advice given by Williams Directs Dryers (Williams DD), its dealers, distributors, agents, or employees shall create a warranty or in any way increase the scope of this warranty. Williams DD warrants that the products delivered hereunder meet Williams DD’s standard specifications for the products. 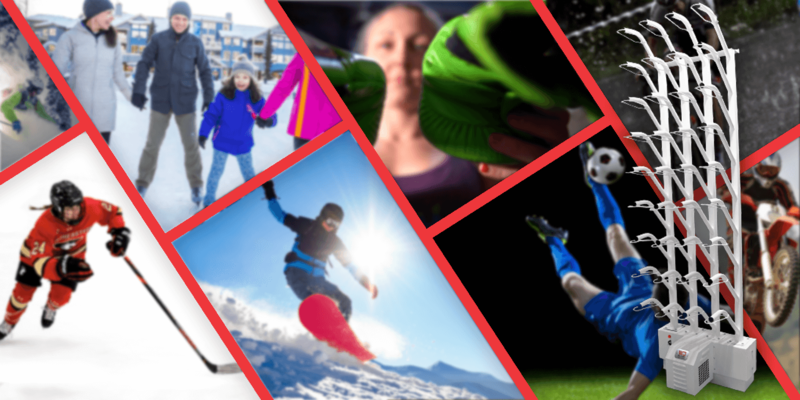 There are no warranties of merchantability or fitness for a particular purpose or any other representations, warranties or conditions, express or implied, statutory or otherwise, other than those herein contained, except that the products will not infringe the claims of any Canadian patent covering the products themselves but Williams DD does not warrant against infringement by reason of the use thereof in combination with other products or in the operation of any process. Customer declares itself familiar with the nature and use of the products and assumes all liability resulting from or in any way connected with Customer’s possession, handling or use thereof. If for any reason the product(s) require(s) repair or service during the warranty period, please call or fax Williams DD to obtain a return authorization number. Upon issuance of the RA#, pack the product securely and return it postpaid to WDD or an authorized agent of Williams DD. Williams DD will repair or replace, at its option, any defective product covered by this warranty. 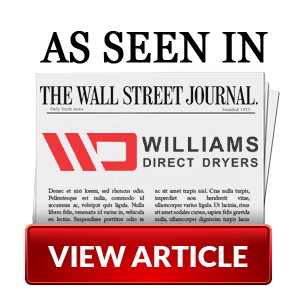 Williams Direct Dryers™ European distributors or importers are unconditionally responsible for the appropriate collection and recycling and treatment of “end of life” Direct Dryers imported from Williams Direct Dryers™ within the European Community. As these laws vary throughout the EU, Williams Direct Dryers™ expects importers to be compliant with the processes in within their specific region. An importer is defined as the person whom purchased the product from Williams Direct Dryers™. Customer will defend, indemnify and hold harmless Williams DD against all claims, loss, liability, damages and expenses on account of any damage to property or injury or death of persons caused by or arising out of Customer’s distribution, storage, handing, use, or disposal of Product or caused by or arising out of any breach of contract, fundamental or otherwise or caused by or arising out of any tortuous acts or omissions or negligence or from any applicable statutory provision or otherwise. All orders for products and/or services will become effective only when accepted by Williams DD by shipment of products ordered, performance of services requested or acceptance of the order by Williams DD is given in writing. All orders for products and/or services will be invoiced at the prices that are in effect on the date of shipment and/or performance of service unless otherwise agreed to in writing by an authorized officer of Williams DD. Pay in full at time of order, by cash, money order, certified check, certified company check, ILOC, bank draft or bank wire transfer the total amount due for that order. Pre-payment via bank wire transfer (Proforma) or ILOC is required on all export orders without exceptions unless otherwise agreed to in writing. Past due payment may be assessed a late charge of $25.00 on all domestic accounts ($250.00 on all export accounts) plus costs of collection, including but not limited to attorneys fees. Additionally, a fee equal to .0025% per day of the total balance due compounded daily may be assessed until the total amount due is paid in full. Returned checks A $100 fee will be assessed for all domestic NSF checks and $500 for all other NSF checks, drafts, etc., drawn on any bank outside of Canada. Sales Tax Sales tax will be charged where applicable unless a certificate of exemption is on file at Williams DD. All shipments shall be FOB Langley Warehouse, Canada inclusive of HST. VAT, Custom Fees, Broker Fees, Insurance, etc.. are not included in the FOB price unless prepaid or otherwise agreed in writing by Williams DD. From the shipping point onward, all risk of damage or loss is with the customer. Williams DD will not be liable to customers for failure to deliver and/or ship on time any products due to causes beyond its control, including without limitation the discontinuance of products and /or services by its vendors, acts of God, war, strikes, labour disputes, acts of government, etc. All terms of delivery expressed in this agreement or negotiated by Williams DD carry the definition as laid out in the International Chamber of Commerce (ICC) publication, INCOTERMS 2000. Unless otherwise expressed in writing our terms are FOB Langley Warehouse. No claim of any kind for Product delivered or for non-delivery of Products shall be greater in amount than and liability of Williams DD is limited to the purchase price of the Product in respect of which damages are claimed together with the transportation charges paid thereon to Customer’s plant by Customer. Failure of Customer to give notice of claim within thirty (30) days from date of delivery, or the date fixed for delivery, in the case of non-delivery shall constitute a waiver by Customer of all claims in respect of such Product. No charge or expenses incident to any claims will be allowed unless approved by an authorized representative of Williams DD. Product shall not be returned to Williams DD without Williams DD’s prior permission and then only in the manner prescribed by Williams DD. The remedy hereby provided shall be the exclusive and sole remedy of the Customer and in no event shall Williams DD be liable for any other damages, whether or not resulting from it negligence. Neither Williams DD, its agents or its employees are responsible or liable for any special, indirect or consequential damages, economic loss or lost profits, loss or injury of any kind whatsoever to persons or property caused by or arising out of any breach of contract, fundamental or otherwise, or caused by or arising out of any tortuous acts or omissions or negligence or from any applicable statutory provision or otherwise. Williams DD offers a 30-day return policy from the time of receiving the product. While Williams DD is committed to maintaining an inventory of its most popular products to meet market needs, it cannot stock all products that it makes available for purchase at all times. Products that are not in stock or that are not a standard or scheduled production item at time of order may, however, be available on special order. A non-refundable deposit equal to 25% of the order may be required on all special order items. In addition, a handling fee of $50 may be assessed for any special order item(s) of $1500.00 or less in value. All terms and conditions, prices, fees, charges, discounts, services, products and product specifications are subject to change and may be discontinued at any time without notice. Williams DD is not responsible for misprints, typos, errors, and omissions that may occur in any and all advertising literature and/or any other type of printed material. These Terms and Conditions of Sale and the document(s) and transaction(s) to which they apply shall be governed by and construed under and in accordance with the laws of the British Columbia and the courts of B.C. shall have jurisdiction. The parties agree that the Sale of Goods Act (B.C.) and the United Nations Convention on Contracts for the International Sales of Goods, or any amendment thereto, shall not apply to this Agreement. These Terms and Conditions of Sale and the document(s) to which they apply does hereby set forth the entire agreement between Williams DD and the customer with respect to the products and services described therein and may be amended only in writing, signed by both Williams DD and the customer. No modifications shall be effected by the acknowledgement or acceptance of purchase order or other documents.